The 1911 is among the most legendary handguns in history, and certainly the most beloved in the U.S. It has served the military through two World Wars, the Korean War, Vietnam, and countless smaller conflicts. It is the quintessential .45, and most enduring of the creations of John Moses Browning; accurate, dependable, potent and supremely easy to shoot well. Its popularity with gun owners is virtually unvarnished even today, over 100 years after its inception. But 100 years is a long time to stand so stolidly in the wake of advancement. Today, ours is the era of the polymer striker-fired pistol, guns whose supreme reliability, simplicity and capacity combined with modern mass manufacture techniques offer a level of performance at a low price that would have been unthinkable back in JMB’s day. The qualities of a pistol chosen for defense must bear a far higher degree of scrutiny than a mere range gun. There are some things the 1911 still does well, but they come with significant tradeoffs that the average user may not be aware of. Below I will discuss the perks and flaws of the 1911 as a working gun. I say working gun meaning a pistol chosen for self defense, not merely a hobby or collectors’ piece. A 1911 of quality manufacture, well-fitted and well-tuned can meet all criteria for a home-defense or daily carry gun: it can be reliable, typically chamber the potent .45 ACP and be very easy to shoot well. The rub is that obtaining a high quality, well tuned 1911 and keeping it in optimal condition is both significantly more difficult and expensive than literally any other common handgun in its category. What he meant by that is that the 1911 is best left to users who are dedicated to learning the ins and outs of the system, learning its unique feeding, maintenance and upkeep requirements, and have a higher degree of skill in those areas. There is rarely ever a drop-in part replacement on a 1911. You cannot expect to buy a $600 1911 and see it run well and hard out of the box. Indeed, $500 will only net you a 1911 near the very bottom of the board for quality. How much performance will that same $600 net you in a modern polymer striker-fired pistol? Quite a lot, and while not as pretty as the 1911 our modern breed of pistols are superb firearms that demand little and offer much. If you are still undaunted, what are some of the other considerations you should keep in mind before selecting a 1911 for defense? Below are major ones, presented in no particular order. Despite modern manufacturing techniques, the 1911 is still a venerable, old school design. Heck, the 1911 built the Old School. While that is undeniably part of the appeal, it means that it depends on a certain level of proper craftsmanship at a basic level to function at all. Even a “rough” 1911 will have tolerance ranges and assembly protocols that preclude it from ever being churned out like Glocks or similar guns. And if a maker tries to do that you will typically end up with a certain amount being defective from the factory. This reliance on high quality material and assembly equates to more cost. You must expect to pay significantly more than competing designs for a comparably reliable, quality 1911. But is the juice worth the squeeze? To its adherents, they’ll say ‘yes’. For the rest of us that want a pistol that is accurate enough, reliable and durable, for a much kinder price, probably not. Today, over 100 years down the road, much has deviated from the original 1911 blueprint. Some things have changed greatly, others slightly, but the result is that every manufacturer of both guns and parts has their own tolerances and specifications on the pistol’s components. 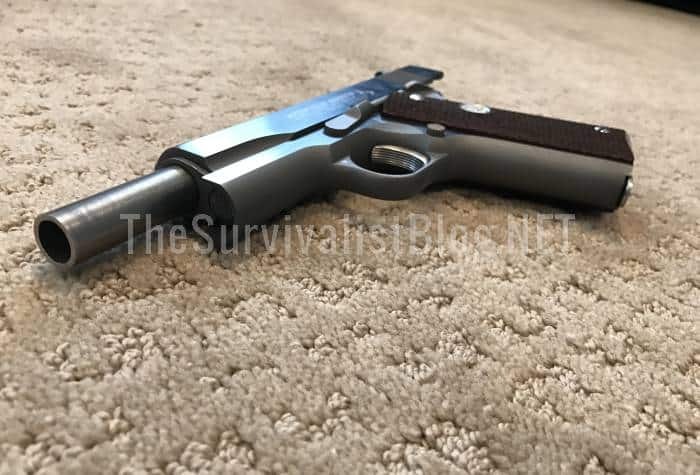 Owing to the fact that just about every single component of the 1911 can be swapped, replaced or changed, this can make for a gun that is “simple” to customize or repair thanks to enormous factory and 3rd party catalogs of parts. Simple does not mean easy, however, and as mentioned above you can depend on any given part, save perhaps the grip screws, requiring a greater or lesser degree of skilled fitting and testing. This greater complexity also means you have more to keep track of and maintain over the life of the pistol. If you like to maintain and repair your own guns, or just like to tinker with them, it is very easy to get in over your head on a 1911 without the know-how and skills to back you up. Start compiling variables like installing a different manufacturers parts on a host pistol, or brand new parts on an older, well shot-in gun, what effect the tolerances of the new part will have on other interacting components and so on and so on, and you’ll easily see that you can outstrip your skill at installation or repair. Tinkerers will adore the ability to tune and tweak a 1911, or customize it to their heart’s content, but scarcely has any gun resulted in more wasted time or money than a user-customized 1911. The design is unforgiving of shoddy workmanship, and even “minor” alterations can hamper this guns reliability. Knowing how to work on a Glock or SIG does not make you a gunsmith, far from it; more modern designs are much more forgiving when it comes to dropping in a part, conducting a function check, test fire and then declaring it good. Maintaining and repairing a 1911 beyond periodic cleaning requires genuine gunsmithing skills, don’t believe anyone who says otherwise. Even a simple extractor replacement requires fitting and tuning for optimal function. 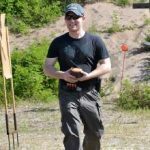 If you are willing to learn and perfect those skills, and learn the sometimes subtle moans and groans of the pistol, have at it. If not, you had better plan on having a spare gun when your primary goes down, as you’ll be sending it to the factory or a knowledgeable ‘smith for repair. In my experience, which I humbly submit as not inconsiderable, I have only rarely encountered a sub-$1,000 1911 that I would declare reliable enough for defensive use. 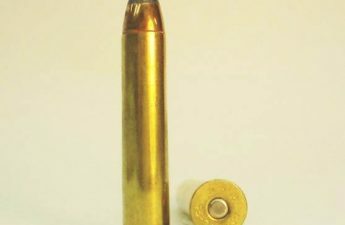 I quantify that as being able to fire 1,000 rounds without a malfunction that is attributable to the gun, and the ability to feed hollowpoint ammunition perfectly. Most models under that price marker will not measure up. Most quality “entry-level” 1911’s will start around $1,250, and quickly go up from there. Top-tier manufacturers’ offerings exceed $3,000. They are incomparably good-shooting and reliable guns, enabling even a decent shooter to punch out a dime and get change back, but at those prices one can buy two to five excellent quality polymer handguns, or a pair of handguns, ammo, holster, mag pouches and class tuition. At those prices, you really must know the “why” of why you want the 1911 over a more modern, reliable and less expensive gun that will has a much lower bar for upkeep for the average shooter. For most people seeking a defensive pistol, the 1911 will not offer much over a quality $600 pistol of different make justify its exorbitant price. There are a great many stripped down “Classic” or “G.I.” models on the market that lack modern sights, controls and refinement, are usually made with inferior materials, and often retail between $500 and $700. These are typically cheaply made imports from the Philippines or elsewhere, and rarely suitable for more than recreation or target shooting. It’s here that you’ll hear a chorus of dissent from advocates of cheap 1911’s in the comments who will decry me as a snob, elitist or what have you and proclaim that their budget 1911 has never given them a problem, has been perfectly reliable and shoots everything they feed it with molecule-splitting accuracy. They ascribe some heraldic sorcery to the design of the 1911 that seemingly makes it immune to cheap, substandard manufacture. What they almost always omit is that they only have 300 rounds through it, all of it ball, and that the first 200 rounds were a little choppy cause it needed to “break in.” First, those meager round counts are not enough to establish any kind of true baseline for performance. Second, sure, if an individual gun has been tested and proven worthy, carry on. You’ll get no complaint from me. But a sample size of one is not enough to declare all examples of a model viable. Like nearly everything else in the gun business, you get what you pay for, and if you are not willing to cough up the stack of bucks for a good 1911 you’ll likely be buying heartache. If you decide to purchase a good 1911, ask yourself honestly if you are willing to endure its quirks and shortcomings to get the hot-rod performance they are capable of delivering. After the honeymoon period is over, you may find you have bitten off more than you can chew. Learning the ins and outs of 1911 type pistols can be very tricky: Guns that appear identical in size, style and configuration can have fundamental differences internally that make a big difference in its desirability as a defensive gun. Does the barrel have an integral feed ramp? Is the recoil spring guide rod original or extended? Internal or external extractor? Does this variation have a firing pin safety, and if so what kind? 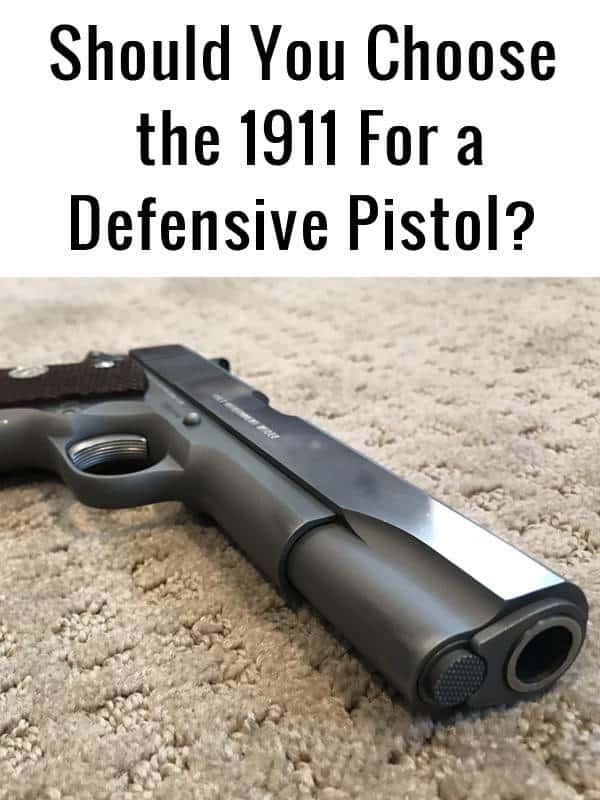 Those are not questions of minutiae; all of those factors make a great deal of difference in determining the viability of a 1911 for defensive use. A comprehensive list and subsequent analysis of all the major 1911 variations and design revisions would be a large work indeed, and since it has been covered extensively elsewhere by masters on the platform I will omit thorough analysis. But below I will cover the major ones. 1911’s come in three basic sizes, Fullsize, or Government, Compact, or Commander, and Subcompact, or Officer. Their barrels are usually 5, 4 ¼ and appx. 3 ½ inches long respectively. Of these sizes, all things being equal the fullsize model will offer superior reliability owing to its more generous operating cycle. Commander 1911’s can run fine when properly setup, but the little Officer’s guns suffer from a greatly abbreviated cycle of operation that can result in sketchy reliability. If you need a very small gun, choose a different design. A significant point of contention among 1911 aficionados is whether or not a firing pin safety is needed on modern examples, and if it is, what style is best. 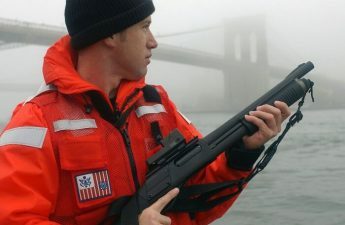 Among these safeties, there are two major variations, one actuated by the trigger, usually referred to as a Series 80 style, and the other actuated by the grip safety, commonly called a Swartz style. The Swartz style is somewhat frowned upon as it is possible through wear or poor fitment to actually drop the hammer of the gun by pulling the trigger prior to the grip safety moving enough to deactivate the firing pin safety. I will spare you a detailed technical lecture and inform you that this will result in a failure to fire through no fault of the shooter. This is obviously a show-stopper for a defensive piece. Both types of safety are still in use with modern manufacturers today, along with classic or “no firing pin safety” variations. The overall design and build objective with a 1911 will vary considerably and to a degree dictate the gun’s purpose. Quality, modern 1911’s are beloved for fine and precisely fitted slides, barrels, frames and other components. It is this high level of fitment, in part, that makes a 1911 feel so nice to shoot and manipulate, but also is proportionally responsible for their high degree of accuracy. But with extremely tight tolerances comes a greater sensitivity to fouling, grit and lack of lubrication. 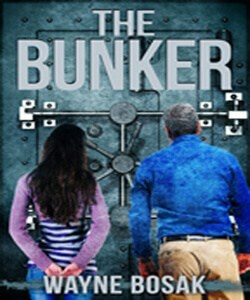 A bank-vault tight gun may be tremendously accurate, but very sensitive to variables like dirt or ammunition. A gun with looser fitment may not be so accurate, but far more forgiving of rough treatment and fouling than the other example. 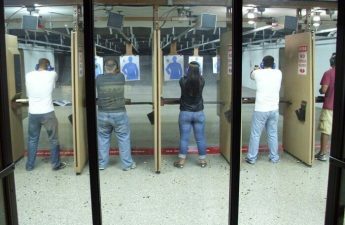 It is possible to have a gun in the “sweet spot” capable of producing excellent groups and being more than reliable enough for duty use. Such a pistol, once again, will either carry a dreadful price tag or be the result of time and attention on the bench of a competent 1911-centric gunsmith. There is far more to know about the 1911 as a system compared to other pistols. Much of it is important for selecting a good one. If you are not willing to put in the hours to learning it, being dedicated to mastering it, they are not an ideal choice. If after all of this you are still determined to worship at the altar of the 1911, you can save yourself a ton of grief by purchasing from one of the factory manufacturers below. This is not the definitive list, and it leaves out many of the most venerated and respected names in the business that still turn out 1911’s one at a time, by hand, for discerning clientele. The original. Colt has suffered from a few stumbles in recent years past but those days are behind them and their factory guns are at this point the best bang for your buck. They are well made and fitted, and use good materials. They offer a variety of models to suit most purposes, including ones with rails. One of the only viable choices in the $1000-$1200 range. Their most popular guns are their cheaper G.I. and Mil-Spec series, but these lack the refinement and quality we need in a defensive gun. Look at their Operator or TRP models for hard-working guns. Long a premier name in high-end 1911’s, Wilson Combat makes some of the best premium 1911’s. Their Professional and Classic models are superb, both start around $3,000. Probably the hottest name in super-high end 1911’s today, Nighthawk offers a wide variety of models for any purpose, but all are made with the highest standards of quality and attention to detail. Nighthawk boasts that every single one of their pistols is assembled and fitted by a single gunsmith. Bring your checkbook: most models start at $3,500 and go up from there. As you can see from the list above, the cost of getting into the 1911 house, just for the gun, is very high. Think very carefully if one of these pistols is the best use of your funds. The 1911, if made to the proper standards, is without question still a viable handgun today. But it comes with a high bar for entry, demanding much in user skill, dedication and finances. If you are willing to learn its intricacies, you may find that the 1911 is capable handgun. However, it is my opinion that the overwhelming majority of shooters today will be best served by a more modern design, either striker-fired or a traditional double-action pistol. Either of these types from a good manufacturer will offer good accuracy and excellent reliability at a price that is often half or less of what even an entry-level 1911 costs. It is for this reason I do not recommend the 1911 as defensive pistol for any but the most dedicated of users. Are you a 1911 fan or no? What is your manufacturer of choice? 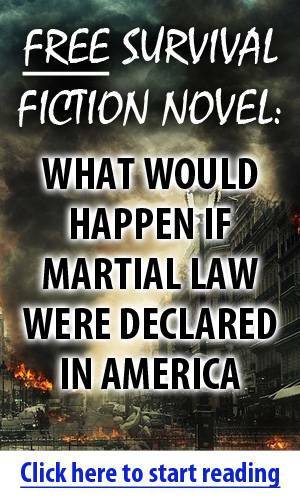 Do you agree with the author’s claims? Let’s keep the discussion going in the comments! Another schill for the glock/9mm round. I do not understand the mindset of the 9mm glock crowd these days. I wonder if glock is paying gunwriters. I understand how gunshops are talking down the 45 so they can sell more glocks. Some things you can`t change peoples mind on. They sure are trying though. I’m no schill for Glock or any other manufacturer. For the record, Glock is not my preferred make of pistol, but they are the standard of our time for a host of good reasons. The 9mm’s advantages today likewise make it an obvious choice for most users. For big, four-legged critters, larger bullets with greater penetration are a prudent choice. For a defensive or duty pistol, one employed where the consistent threat is another human, the .45 ACP’s only standout advantage over the 9mm when using modern projectiles is consistently better performance through automobile glass, and even then it is not a night and day difference. The 9mm is not some mere target cartridge, I assure you. Don’t take my word for it. 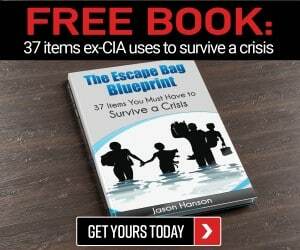 Seek out information on the topic furnished by Dr. Gary K. Roberts foremost, and the older FBI report compiled by Urey Patrick for more. I am not arguing with the premise of the article, as you are probably correct. Just an odd ball outlier, I had picked up a .45 Llama 30 years ago for 250 bucks. Nothing fancy or pretty. It will eat anything I have put through it and has gone way beyond 1000 rounds as a range toy. Accuracy? Not so much. Minute of pie plate easy. But then again I never ran into a 1911 in the Marines that did any better. I believe it. Lots of older military service and other legacy 1911’s nowhere near as tight as today’s hot-rodded commercial guns, but run very reliably. If yours runs hard and is accurate enough for your purposes, drive on. You’ll get no complaint from me. I bought a Taurus PT-1911 several years ago and have probably put close to 1000 rounds through it with all kinds of ammo…no problems. It shoots better than I do. I also have a Kimber Ultra Carry II, it shoots really well, but I haven’t put near the rounds through it as I have the Taurus. I have an original Colt .38 Super Auto on the 1911 frame that has a serial number under 9000. It’s a hoot to shoot! I guess I’m just an old 1911 fan. I carry a Colt .32 in an ankle holster as a back-up to my back-up Kimber!